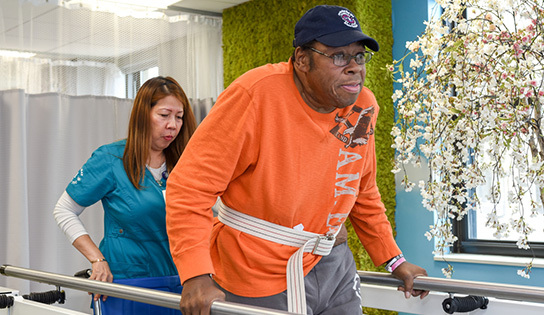 When Marie W. arrived at Cortlandt Healthcare she was eager to start her rehabilitation journey. Marie W. was initially presented for vertigo from infrasound and some unsteadiness in her feet and balance. Marie W.’s evaluation for rehabilitation determined that she would be able to receive rehabilitation sessions six times a week and made sure to be seen daily. Specific goals were made for Marie W. to ensure she would have the most successful discharge home. The first goal for Marie W. was to improve her balance especially while standing. Marie W. had poor balance, she needed assistance to get into the standing position, and once there she was not able to stand very long. After four weeks, Marie W. was able to stand up independently and able to hold her balance for 1-2 minutes! The next goal was to ambulate 350 feet using a rolling walker. Marie W. was only able to ambulate 25 feet at first, but by the end of her four weeks, she had successfully walked 350 feet with her rolling walker! Once Marie W. was able to conquer her balance and ability to walk steadily with the rehabilitation team, the next goal was the stairs. Marie W. had to be able to ascend and descend four steps and within a week, and she did just that. Throughout Marie W.’s stay, she had made many friends, participated in activities, and showed her determination in her rehabilitation journey. She also shared, “I was here before, a few years ago and they treated me very well. I knew to come back because I knew I would get better again. The nurses have been so good to me and all the aides are just great! When it comes to the rehab department they have all been excellent, they are really giving me a good workout!” We here at Cortlandt Healthcare love hearing feedback as positive as Marie W.’s. It is our honor to give Marie W. the Renewal she deserves.